This intriguing program aims to give your vocals the inhuman touch. A challenge that often arises in film dubbing and sound for video games is making the human voice sound a bit less, well, human. We want our space creatures, talking animals and sinister robots to sound genuinely unsettling and alien; yet at the same time, their diction still needs to be comprehensible. Over the years, almost every audio processor ever invented has been deployed to square this particular circle, from delay lines and ring modulators to pitch–shifters, filters and funky digital cleverness of all stripes. What all of these have in common, though, is that they weren’t designed specifically for the purpose, so sound designers working with them have had their capacity for creative improvisation tested to the full. Software developers Krotos have seen this situation as leaving a gap in the market, which they have sought to fill with Dehumaniser Pro: a cross–platform, stand–alone application specifically designed to take live or recorded human speech and warp it to create special–effect voices for sound design and music. The signal processing that underlies Dehumaniser Pro is mostly familiar from other digital effects, but what’s distinctive is the way in which it is targeted towards its intended function. When you first open the program, what you’ll see is the Simple Mode interface. The central feature of this window is the Voice Designer, a large dish–shaped display which serves as a kind of X-Y controller, morphing between your choice of six presets loaded into slots spaced around the edge. Switch to Advanced Mode, and you’re presented with 11 faders, each controlling the level of a different effect process, while a large central window displays parameters related to whichever of these is currently selected for editing. Some of these processes have familiar names such as Pitch–shifting, Noise Generator Granular and Cross Synthesis, but the likes of Animal Convolution and Scrubbing Convolution are more unusual. The Extended version of Dehumaniser Pro goes further by offering a number of Modulation options for each process, allowing you to apply LFOs and so on to key parameters. Dehumaniser Pro can work with pre–recorded files, but is designed primarily for real–time use. As such, it can accept a live input from your audio interface and write its output to disk. It can also host plug–ins in Audio Units and VST formats, but what it can’t do at present is act as a plug–in in its own right. Nor is Rewire supported, so if you want to use Dehumaniser in conjunction with a DAW, you’ll need to employ a utility such as SoundFlower or Jack to route signals in and out. 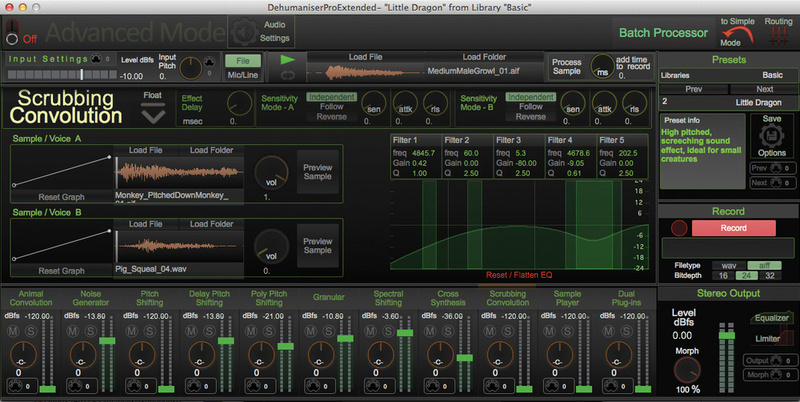 The basic preset bank supplied with Dehumaniser Lite and Pro is fairly sparsely populated, but does an adequate job of showing off the different sounds that can be produced. However, it’s perhaps a shame that the full preset library is only available to users of the Extended version, especially given the limited editing features in Lite. There’s not space to go into detail here about what all the different Dehumaniser processes do, but for the curious, everything is explained pretty clearly on Krotos’s web site. Cross Synthesis and Animal Convolution provide different ways to impose the timbre of another sound on the source, the former allowing you to load samples from a small selection of animal sounds. Most of the other processes involve manipulating the pitch or frequency content of the source, whether through granular processing, conventional pitch–shifting or Spectral Shifting, which applies pitch–shifting only to certain parts of the frequency spectrum. 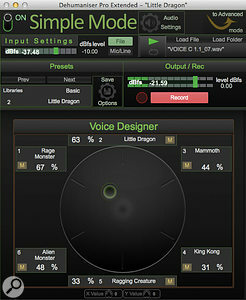 You can also add third–party effects in the Dual Plug–ins process, and trigger samples alongside the source. A master equaliser and limiter help to keep the results under control, and there are comprehensive features for assigning MIDI controllers to effect parameters. A master mix control allows you to retain some of the dry signal in the output, which can help to keep speech comprehensible. In use, there were times when I wondered whether it was really necessary to have so many different processing options, because to a large extent they all tend to pull in similar sonic directions. In particular, I’d have thought the various pitch–shifting options could be amalgamated to some extent without losing too much functionality. Most settings tend to bring in some combination of sinister low–mid rumbling, gritty distortion and cyclical modulation or delay, often adding a perceptible tail to the sound. Taken together, they add up to a product which caters mainly to the dark end of the spectrum: horror and sci–fi voices tumble out of Dehumaniser much more naturally than kids’ TV characters or happy pixies. But if that’s your bag, there’s certainly nothing to beat the immediacy of plugging a mic in, loading up a preset and tracking your vocals ‘in character’, rather than recording clean in anticipation of finding a suitable effect further down the line. Dehumaniser’s Voice Designer lets you morph between up to six presets.It’s still relatively early days for Dehumaniser, and as a result there are a few rough edges apparent. Most obviously, it seems to impose quite a heavy CPU load on the source computer, not that this is a huge problem in a stand–alone application. A couple of the effects processes in Advanced Mode seemed disinclined to generate any audible output, even when they were moving the meters; I’m not sure if this is a bug, or whether they were simply operating out of the range of human hearing! I was also a bit confused by the relationship between the Simple and Advanced Modes: settings in the latter don’t reflect the goings–on in the Voice Designer, which seems a bit of a shame. However, it’s clear that Krotos are very active in developing the program, and have already added features such as a batch processing option (in the Extended version) in response to user feedback, so I’m sure it won’t take long for any issues to be ironed out. The case for Dehumaniser Pro in post–production, then, is pretty strong. In music–production contexts, meanwhile, I think its appeal will be fairly genre–specific, and it tends to obliterate any melodic content, but I can see it getting a lot of use in darker flavours of IDM and metal, as well as industrial music. And, of course, you don’t have to dehumanise voices — most of these effects can be put to good use on drum loops, guitar, keyboards and anything else that needs to be taken out of its comfort zone! Most of the individual processors that are used in Dehumaniser can be found as individual effects, and given time and effort, you could probably assemble something comparable using the modules in INA’s GRM Tools or NI’s Reaktor. 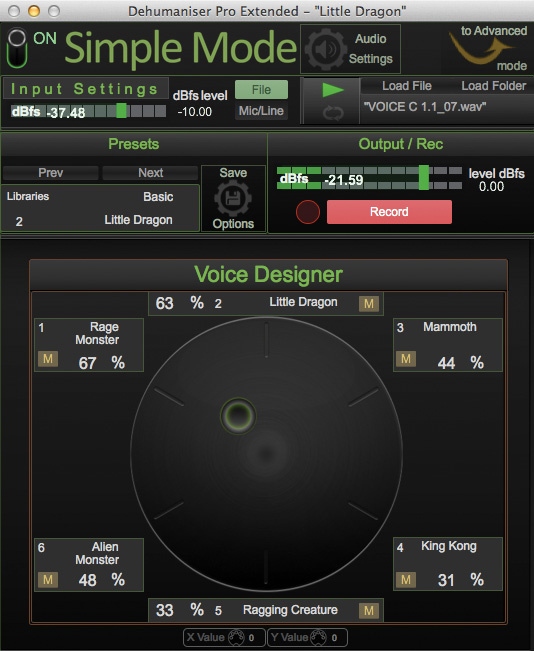 Alternatively, there are other processors designed to transform the human voice in rather different ways, such as the Flux IRCAM Tools Trax Transformer plug–in. Dehumaniser comes in three versions, designed to suit different needs and budgets. The simplest and most affordable is Dehumaniser Lite, a largely preset–based version which does away with the Advanced editing mode altogether and offers only the Voice Designer. Those who opt for the deluxe Extended version, meanwhile, not only get features such as the Modulation options and batch processor, but also a much larger library of presets, including a number created by well–known sound designers. Feature set carefully tailored to its intended purpose. Offers a rich variety of (mostly) dark and sinister vocal treatments. Real–time use has the potential for fast, creative operation. Can’t be used as a plug–in. You don’t get many presets unless you fork out for the Extended version. Current version is not yet quite as polished as it might be. 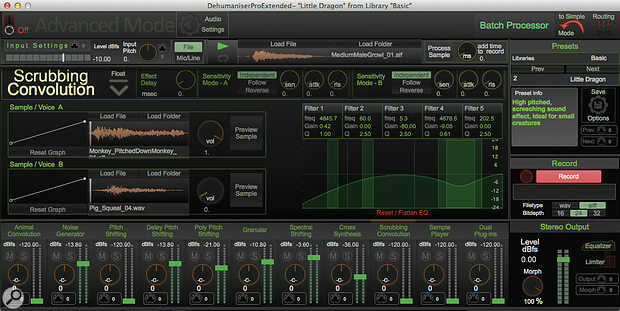 Dehumaniser Pro fills its post–production niche in an interesting and very usable fashion. It won’t be useful in all musical styles, but is definitely worth investigating if you have a taste for the dark and twisted. Lite version £58.80; Pro version £238.80; Extended version £358.80. Prices include VAT. Lite version £49; Pro version £199; Extended version £299.